What on Earth is a Pantser? What it means is writing “by the seat of your pants”, i.e. literally making it up as you go along, letting instinct and imagination carry you rather than rational planning. Which is of course what plotting is all about: planning the structure of your book’s action before you get down to the serious writing. For some authors, sketching out a basic running order and cast of characters counts as plotting. At the other end of the scale lie authors who fill dozens of index cards with scene summaries and spend ages laying them all out on the floor to get them in the right order. Others favour Randy Ingermanson‘s “snowflake” method, where you start with a basic outline then keep adding details like the branches of a snowflake (or, what makes more sense to me, a tree – because stories, unlike snowflakes, aren’t six-pointed and symmetrical). These days it’s possible to do all your planning on your computer, using software built for authors, such as Scrivener, which includes a virtual corkboard and index cards to aid advance plotting. At risk of sounding indecisive, I think I’m a bit of both – I like to set up chapter headings, whether I’m writing fiction or non-fiction, and to have the basic story outline in my head at least before I kick off. But my favourite part of writing is when the subconscious mind takes over, and all those bits that you’ve been working on without even realising suddenly surface and pour out on to the page, as if you’re taking dictation. In my current work in progress, I was startled when a new character appeared unplanned and started heckling the others. His name’s Billy, and he doesn’t miss a trick. Watch out for him in Best Murder in Show, my current WIP (more writers’ jargon – it means Work in Progress), which I hope to publish later this year. By the way, in case you’re wondering, I’m typing this fully clothed. Just saying. If you’d like to hear authors talking about the subject in more detail, tune in on YouTube to the panel I chaired on the topic for the Alliance of Independent Authors’ Indie Author Fringe Fair at the time of the London Book Fair 2016. Here’s the link. If you’re an author or an aspiring writer and you’ve not yet come across the Alliance of Independent Authors (ALLi), it’s time you did! I am Commissioning Editor of their Author Advice Centre blog, and there’s a new post just about every day, each from a successful author sharing best practice and top tips. 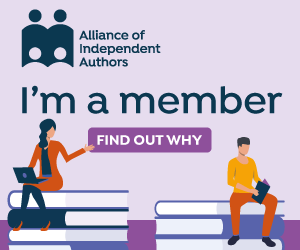 You might also like to find out more about becoming a member of ALLi, which offers many exclusive membership benefits to authors at all stages of their career, from pre-publication to bestseller – click this link for details. Did not know that about Victor Hugo — how hilarious!! And “Best Murder in Show” is a great book title! Finally, I’m like you, I plot, and then I let go and see where the writing takes me. I love that nugget about Victor Hugo, Debbie! I’m definitely a bit of both when it comes to this, but on balance I think my heart is in the pantser rather than the plotter camp — or rather the plotting tends to come about later on. I normally start with the spark of an idea (garnered from something I have seen or heard) and a main theme — which I outline at a very high level and then get to work. The rest sorts itself out as I go along, but huge amounts of rewriting and editing are needed. And it was noticeable that in my book Eeek! The Runaway Alien, where I had outlined in far greater detail, how much less revising was needed.